Cockroaches might seem funny at first, but when you have an army of pests like German cockroaches taking over your home or business, trying to get rid of them alone with hardware store methods isn’t something you’ll laugh about. For this reason, you should consult pest control experts if you have a German roach problem. Pest control experts are the only professionals who can truly eradicate this frustrating and common problem for residential and commercial property owners. The German cockroach species is the most common type of roach that infiltrates restaurants, hotels, apartments and houses. There’s nothing pretty about these pests. Entomologists describe the adult German cockroach as 1/2 to 5/8 of an inch in length with light brown or tan coloration, featuring two black horizontal stripes behind the head. The adults have wings but prefer to run, and run quickly, in fact, as those who have witnessed the speed of a fleeing roach know very well. They run almost as fast as you will when you see one in your home! German cockroach infestation is a serious matter, and should be handled as soon as possible. Studies have found that these insects carry diseases on their legs and bodies that can be deposited on food, utensils and other things as they go foraging. Diarrhea, food-poisoning and dysentery are just a few illnesses the German cockroach can carry with it. People can also develop breathing problems like asthma and allergies due to a roach’s excrement existing in the living area. Cockroaches of the German variety are tough to get rid of by those who are not professionally trained to do so. Our pest control experts understand how to proceed in a situation involving German cockroach infestation. 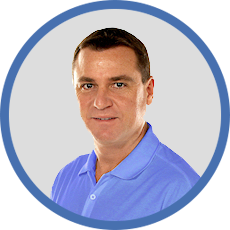 They are experienced and knowledgeable about the habits of these pests. Our experts know that these roaches can reproduce quickly; female German cockroaches only need to mate once to produce babies. After mating, they will produce on average, 4 to 6 egg cases during the course of their lives, with each egg case holding up to 40 eggs. The alarming numbers show that in one year more than 10,000 descendants can be produced, assuming two generations per year. Given their uncanny ability to multiply so quickly, it’s important that you call our experts the second you know that German cockroaches have infested your building, so that we can rid you of them, and protect your property from future infiltration. Cockroach infestation does not cause structural damage to a property indoors, but these pests love starch and will chew on book bindings and any other paper lying around. German cockroaches also leave behind stains and odors on furniture, clothing ,etc. They can enter a home or business via boxes, grocery bags, suitcases, etc. These pests prefer warm, humid rooms, between 70 to 75 degrees F. If these insects are inside your home, you will likely find them grouping in your kitchen and bathrooms, near the plumbing pipes. Our pest control professionals at Island Pest Control advise residents or business owners to call them immediately if you are experiencing cockroach infestation. Your own efforts will likely be ineffective in ridding yourself of these pests, as a simple insecticidal spray or aerosol fogger will do little to eradicate the problem. 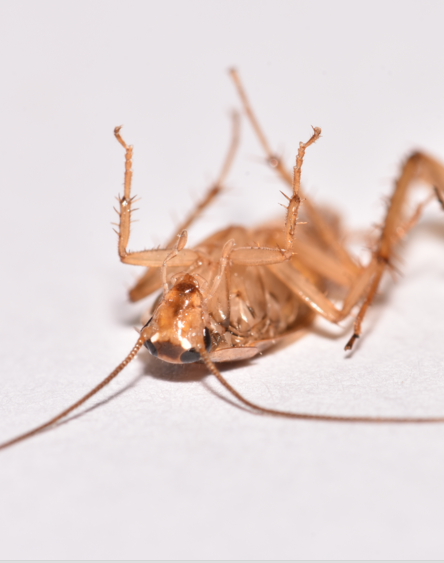 Our pest removal specialists often use gel baits to remedy a German cockroach infestation. These traps offer a bounty of food in the bait poison to lure the roaches out of hiding. Alternatively, Island Pest Control will also use powerful insecticides to get rid of German cockroaches. Plus, our experts can minimize the risk of insecticides in the home by pinpointing the crevices where this species likes to hide. This ensures that these insecticides only come in contact with the roaches, and not you. 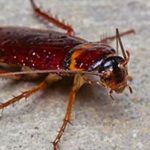 Our pest experts at Island Pest Control will also show home and business owners how to prevent the German cockroach problem from returning. Getting rid of clutter and excess paper can help. Storing food in sealed containers, mopping up all liquid spillages immediately, and cleaning food crumbs from under refrigerators, ovens, and other appliances can also be key in preventing an infestation. When it comes to an army of German cockroaches, don’t go it alone. 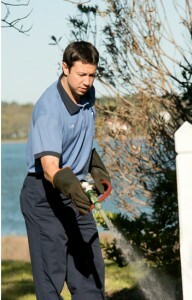 Call in the big guns- the professional pest control experts at Island Pest Control.